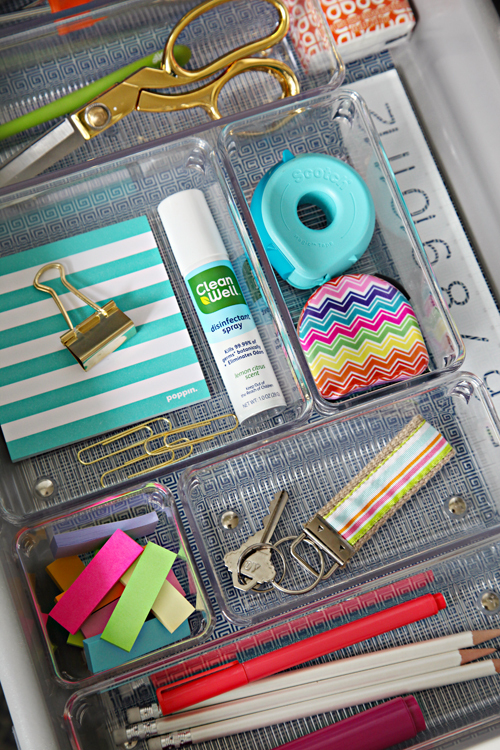 IHeart Organizing: An Organized Happy Drawer with Chic Shelf Paper & a GIVEAWAY! 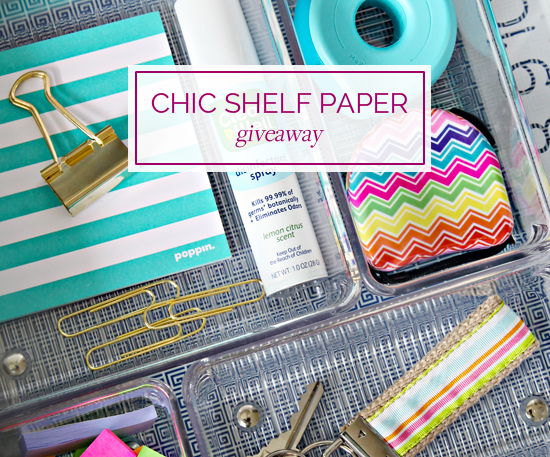 19 An Organized Happy Drawer with Chic Shelf Paper & a GIVEAWAY! Happy surprises come in a variety of shapes and sizes. It could be the gift of coffee from the car ahead of you in the drive-thru. Or a friend randomly stopping by just to say hello. My personal favorite is when my kiddos pop up behind me and say, "Surprise hug!" while wrapping their arms around me. Random life surprises are amazing. 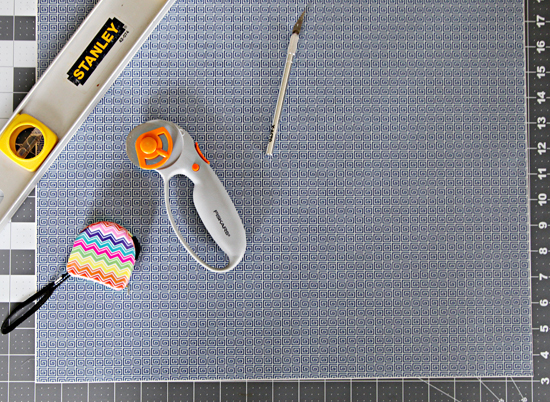 But there are also ways you can create small happy surprises throughout your home. Those special little moments that make you smile day after day. 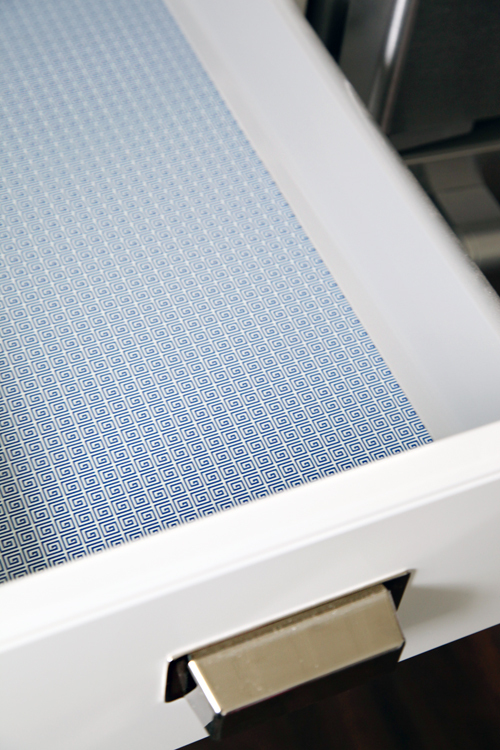 When I am picking up our home or even just grabbing for a pen, opening a drawer lined with decorative paper is sure to perk up my cheeks. Ditto for opening a painted or wallpapered closet. That instant pop of pattern and color in those common mundane spaces is always a win. I know it may not be that way for everyone, but on top of loving the prettiness of it, it really helps me maintain the spaces I organize. I have lined our drawers with everything from gift wrap to contact paper to even wallpaper. 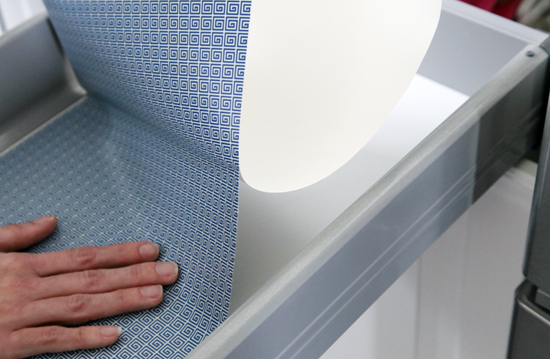 When it comes to the kitchen and bathroom, nothing really compares to true shelf liner. 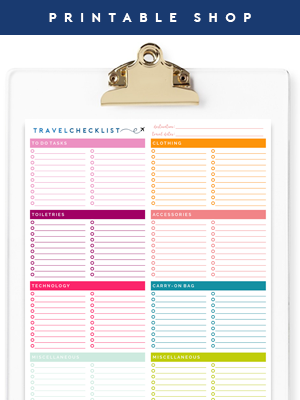 In those spaces, it is ultra important to select papers that are durable and easy to wipe clean. The folks at Chic Shelf Paper asked if I wanted to give their pretty patterned liners a try. Knowing we have an entire kitchen to organize, I started browsing their endless selection of colors and options. You may have noticed when I recently organized our pantry, I added a dash of pretty navy greek key paper... Makes all the difference right? Living in chaos of a renovation for months has been a little nerve wracking, so to bring a little normalcy back to life, I have been slowly unpacking and organizing our kitchen drawers. Today, I organized our "essential" drawer and thought I would walk through the lining process a little more thoroughly. To get started, I always clean out the drawer with a vacuum and a rag. This prevents any bumps under the drawer liner. 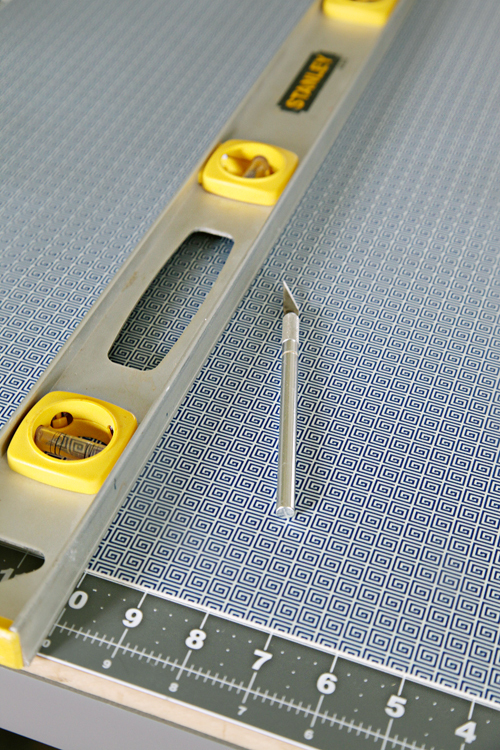 I then lay out my tools; a large cutting mat, a straight edge (I just use a level), a slicer/craft knife and a tape measure. 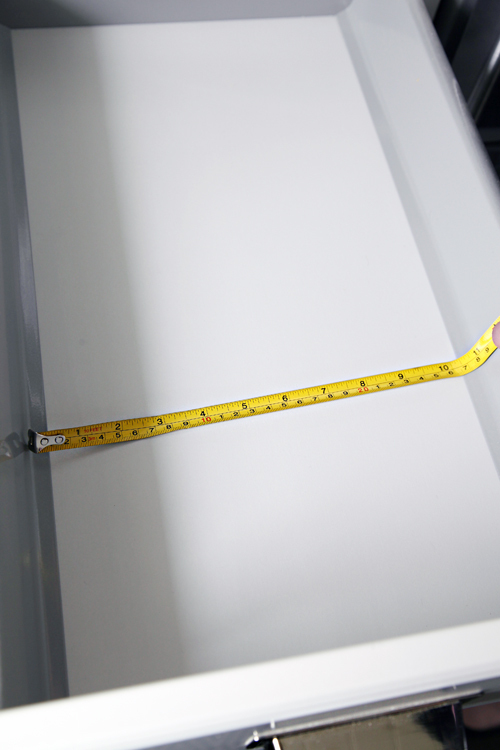 Using the tape measure, I measure the bottom of the drawer for both length and width. I then use the mat paired with my straight edge to slice the paper accordingly. 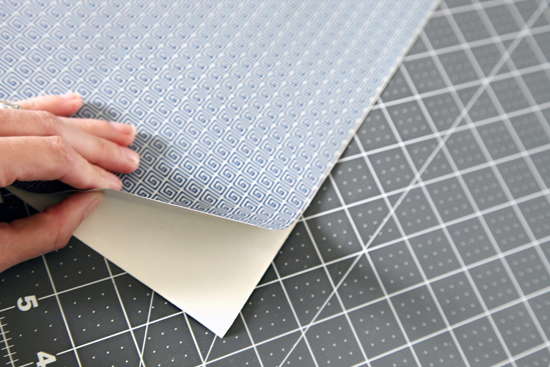 Cutting papers can be really frustrating, and this has been by far the easiest and quickest way to get a nice, accurate cut. The shelf paper I was using for this project is super nice and thick (twice as thick as typical contact paper). This also makes a world of difference in the ease of installation. The flimsier the paper, the more you will struggle with it sticking to itself and running the risk of bubbling. The paper came with a squeegee for installation, but I haven't had to use it. It repositions beautifully so if I don't get it just right the first time, I can easily shift it and try again. Then I just press it smooth and done! Typically, I find the paper too pretty to cover all the way up. That is where the happy surprise comes in when I am grabbing for that ruler. It is also why I generally use acrylic organizers/dividers. We still have a room of boxes to unpack, but the addition of this single drawer is sure to be handy as we keep trucking along. Having worked with so many types of papers, I am pretty sure that the Chic Shelf Paper has been some of the easiest, most durable to work with. Plus, they have the largest selection I have seen. They have a new number one fan! 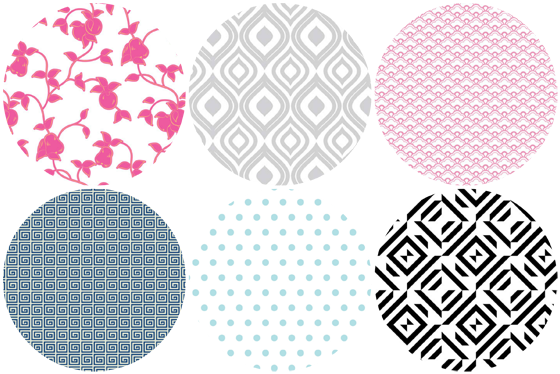 Below are a few of my favorite patterns... You can probably guess that I am scheming to find a place for those pink ones. At least a place where my boys won't give me the stink eye. Because I want for you to be able to create those happy surprise moments around your home, I am partnering with Chic Shelf Paper to give you a $100 credit to their online store! 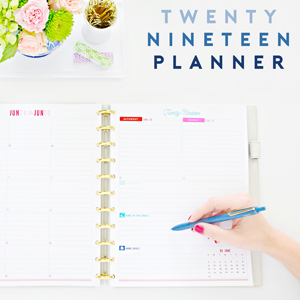 From now through May 31st, you can receive 10% off your Chic Shelf Paper order of $50 or more with code ChicOrganizers. Good luck all! And I would love to know what is a must have for your "essential" drawer? So pretty! I need to get my drawers organized this spring! Oh, how I wish this giveaway would be open to the rest of the world also. Happen to live in Finland, so no chance to win :( Glad we can get a discount though :). 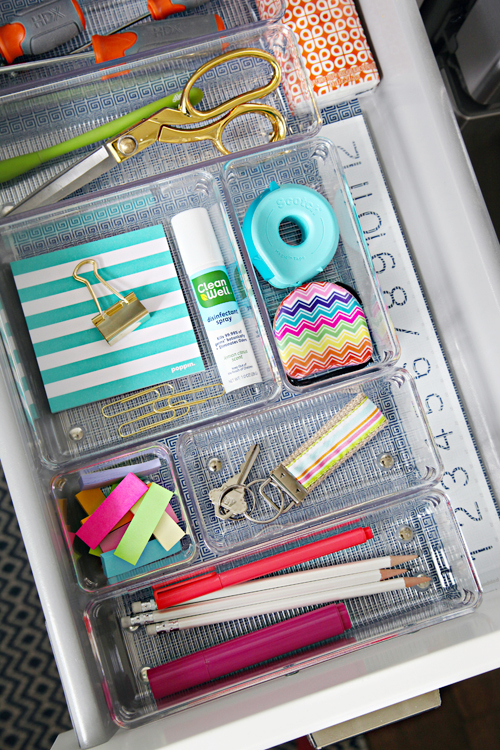 Jen - I love your pretty drawers and use of acrylic organizers! where did you get the tape measure? I used to have one for my purse and it broke so I'm stuck using a sewing one that doesn't retract. 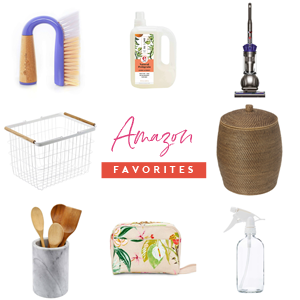 I'm always reaching for it when shopping for my home. Thanks, I tried googling for them but couldn't find any. 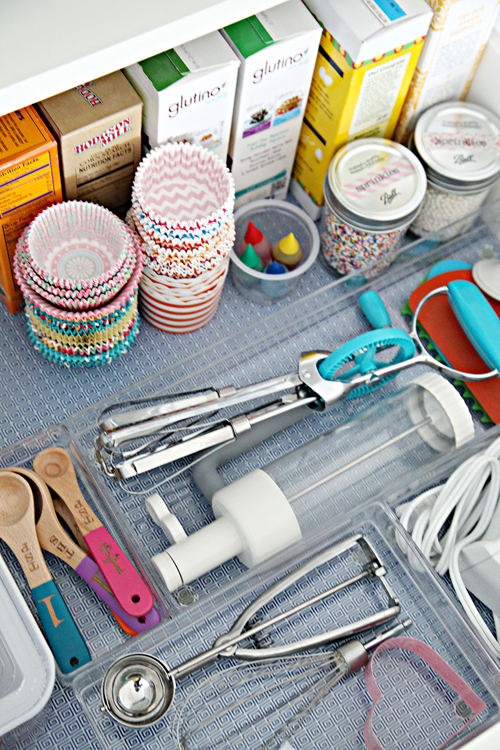 I encourage clients to drop "junk drawer" and use the term "utility drawer." After all, why would you dedicate a whole drawer to junk, right? Pretty! This is just what I need. I love that blue polka dot one. Oh how I swoon over your simple yet beautiful organizing! I have been slowly changing out my dollar store drawer bins for acrylic ones. That paper makes it so pretty! Thanks for sharing. And by the way, LOVING your kitchen redo! Can't wait for the next post. I went to their site and they have some lovely options. 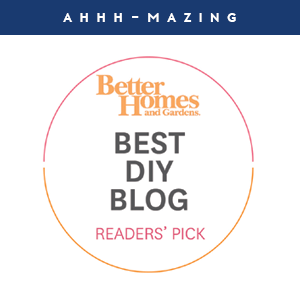 Great giveaway, we sure could use them in our bathroom vanity drawers. Fingers crossed! Thanks for sharing! 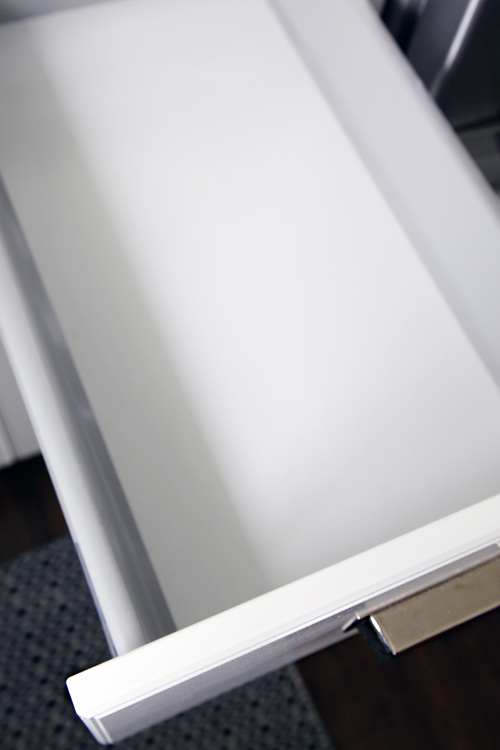 Oh, I love how crisp and clean your drawer looks! To answer your question, I think scissors (or a blade) and a ruler are essential in a utility drawer. I never thought about it, but having something pretty on the bottom of the drawer really does make a huge difference! This is awesome! I love clean drawers even though our junk drawer is atrocious! 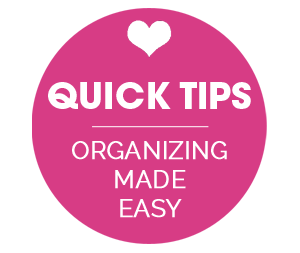 You always make organizing seem so fun. I would love to know where I could get your cute striped key holder. Where did you find that cute scotch tape dispenser? Do you like how it works? Could you tell me where your wooden measuring spoons are from? Thank you so much for taking the time to look into that and reply. Found them on Amazon.